Every garage door has to be replaced eventually. The most common reason for this is the poor condition of the old unit. In some cases, replacement is required due to severe damage caused by an accident or natural disaster. In others, homeowners are simply interested in upgrading to a newer model with more advanced features. The first step involves making a number of important decisions. You have to decide whether you want to replace only your door or your opener as well. When you consider opener replacement, you have to take into account the age, condition, and technology of your existing unit. If you decide to keep it, you must ensure that it will be capable of handling your new door's weight. You need to outline your requirements as part of the first step. You have to decide on the manufacturer, model and type of opener you prefer. You need to take into account the weather conditions in your area, the noise level you're willing to suffer on a regular basis, and your budget as well, in order to come up with your precise requirements. It's always good to consult with our experts before buying, just in case there's an important factor you've neglected to consider. The second step involves comparison shopping. It pays off to compare as many models from as many brands as possible. 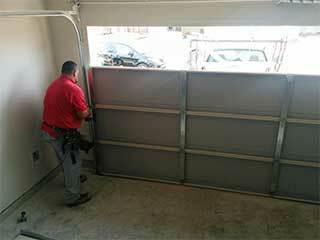 You should definitely check out Amarr, Martin and Clopay garage doors. The comparison should be easy given that you will have the list of your requirements at hand. You should check the R-value of each model as part of the comparison to ensure that you will get a unit with satisfactory energy efficiency and insulation qualities. The final step involves replacing your old garage door with the new one. In order to prevent a lot of future issues, and to ensure that it gets done safely, contact our experts at Garage Door Repair Miami and we'll get your new door installed in no time.